Emperor of Ethiopia Haile Selassie in the Throne Room of the Jubilee Palace. Haile Selassie was an Ethiopian regent and emperor who faced decades of turmoil as a leader, including exile and imprisonment. Eventually, he became known as a prophet and messiah of the Rastafari religious movement, and today is seen as a divine being by Rastafarians. Spouse: Menen Asfaw. A previous spouse, Woizero Altayech, is alleged but not confirmed. Children: Tenagnework, Asfaw Wossen, Zenebework, Tsehai, Makonnen, and Sahle Selassie (with Asfaw). Princess Romanework is believed to be the daughter of his previous union. Haile Selassie was born Lij Tafari Makonnen, on July 23, 1892, to Makonnen Wolde-Mikael Gudessa and Yeshimebet Mikael. Makonnen was a general in the Ethiopan army and governor of the Harar province, as well as a cousin of the Ethiopian Emperor Menelik II. In Ethiopian dynastic traditions, all rulers trace their ancestry back to Menelik I, who was a son of King Solomon and Makeda, the Queen of Sheba. Tafari, as he was known in his early years, was educated at home by French missionaries, and was by all accounts an excellent student with strong critical thinking skills. When he was thirteen, Tafari was given the title of Dejazmach, which is the equivalent of Count. A year later, in 1906, Tafari's father passed away, and he assumed the titular governorship of the provinces of Sindamo and Selale. Although he was still a teen, the small size of these regions meant that he still had time to continue his education while acting as governor. By 1910 he was appointed governor of Harar, following the death of Emperor Menelik II. Allegedly, during this time period, he was married to a woman named Woizero Altayech; scholars believe that Altayech may have been a nickname. Although the details of their union are scant, it is known that he became the father of a daughter at this time, Princess Romanework. In 1911, Tafari married Menen Asfaw, with whom he eventually had six children. Menen was the niece of Lij Iyasu, who was the uncrowned heir to the Ethiopian throne. In 1916, Iyasu was deposed, and fled Ethiopia. Although there is some question about how involved Tafari was in the coup, following these events, Iyasu's aunt Zewditu—who was Menelik II's daughter—took the throne. Tafari was elevated to the rank of Ras (equivalent to Duke), and made a crown prince. In addition, Zewditu named him as her heir and regent, and promised that she would be a just ruler with his counsel. Ras Tafari maintained daily administrative tasks for the country, and worked to modernize Ethiopia, much like Menelik II had done. In 1923, he promised to end slavery, thus ensuring Ethiopia's admission to the League of Nations (of note, slavery continued in the country through the 1930s). During the next few years, Tafari toured the Middle East and Europe extensively, working on diplomatic missions. Although he recognized the need for European allies, he was wary of working too closely with them, and stressed that Ethiopia needed economic independence. Throughout this period, he tightened his control of many of the Ethiopian provinces, and matters came to a head in 1928, when his authority was challenged by Balcha Safo, the governor of Sidamo province. Empress Zewditu sided with Safo, and accused Tafari of treason, due in part to a peace treaty he had signed with the government of Italy. Following a coup at the Empress' palace, she relented and declared Tafari king. On paper, Tafari and Zewditu ruled together, which was something that had never happened in Ethiopia before. In 1930, Ras Gugsa Welle, who was Zewditu's husband, led an insurrection against Tafari. He was killed, and just a short time later, the empress herself passed away; there were rumors that she was poisoned, but modern scholars believe she actually died from complications of diabetes. With Zewditu gone, Tafari was crowned King of Kings of Ethiopia, and took the name Haile Selassie I. In 1931, he introduced the country's first constitution, calling for a bicameral legislature. Some saw this as the first of many steps on the road to democracy. Three years later, Italian forces invaded Ethiopia under orders from Benito Mussolini, and Selassie mobilized an army. The Ethiopian army suffered heavy losses over the period of several months of battle, and the emperor's troops withdrew from the front in 1936. He and his family decided to decamp the capital in Addis Ababa, and headed for French Somaliland. Meanwhile, Mussolini declared that Ethiopia was now an Italian province. From 1936 to 1941, Selassie and his family stayed in Bath, England, and he occupied much of his time writing his memoirs and life story. In addition, he worked tirelessly against Italian propaganda and was vocal against violence perpetrated against Ethiopians by Mussolini's forces. He attempted to garner international support for his country, and pled for intervention by the League of Nations. In 1942, he returned to Ethiopia to take his country back from Italian occupation. 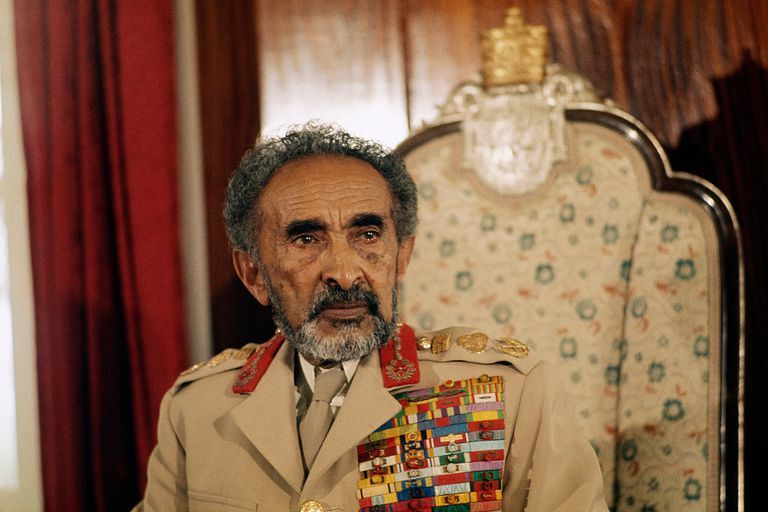 Over the next two decades, he attempted to reform the country's governmental structure by introducing taxation on church properties, abolishing slavery, and attempting to reduce conflict between Ethiopia's various ethnic groups. Unfortunately, civil rights suffered under Selassie's reign, and in 1960s and 1970s, there were countless atrocities committed upon civilians by the Ethiopian army. In addition, a mass famine heavily impacted the population of several provinces. In 1974, a military junta called the Derg staged a coup against Selassie, who by then was in his eighties. He was placed under house arrest in Addis Ababa, while the surviving members of his family were imprisoned in Harar province. Dozens of his former government officials were executed by firing squad, and in 1975, Selassie died. Although the official story was that he had succumbed to respiratory failure, in the 1990s an Ethiopian court announced that he had been "strangled in his bed most cruelly" by the perpetrators of the coup. The Derg, which was backed by Soviet funding, was overthrown in 1991, and a year later, Selassie's bones were found under a slab in the imperial palace. He was given a full state funeral in 2000, some 25 years after his death. During the 1930s, Jamaican activist Marcus Garvey followed the coronation and rise of Haile Selassie with interest. Garvey famously said, "Look to Africa when a black king shall be crowned, for the day of deliverance is near." Many of Garvey's followers in Jamaica believed that Selassie, originally called Ras Tafari, was the black king of the prophecy. If Ras Tafari was the king, then it stood to reason that deliverance was coming soon. Over the next few decades, a movement in Jamaica grew, honoring Selassie as the divine messenger of God. When he visited the country in 1966, he was greeted as a holy redeemer. African-descended Jamaicans had spent centuries as slaves, taken from their homelands in Africa. They saw Selassie, the man who stood up to the white Italian army and took back his homeland, as a messianic figure, who would lead black people into a golden age of eternal peace, prosperity, and righteousness. As a descendant of King Solomon and the Queen of Sheba, Selassie was referred to as the Conquering Lion of the Tribe of Judah. The Rastafarians believed that Jah—the Rasta name for God—had simply inhabited the body of Haile Selassie, and that when he died, it was "a sign that Jah was not just a human being but also a spirit." Today's Rastafarians believe that they will be repatriated to Ethiopia to live in freedom, led by Haile Selassie. Dimbleby, Jonathan. “Feeding on Ethiopia's Famine.” The Independent, Independent Digital News and Media, 23 Oct. 2011, www.independent.co.uk/arts-entertainment/feeding-on-ethiopias-famine-1189980.html. “The Prophecy by Marcus Garvey. Published November 8, 1930 in "The Blackman:” Jamaicans.com, 17 July 2015, jamaicans.com/MarcusGarveyProhecy/. Thomson, Ian. “King of Kings: The Triumph and Tragedy of Emperor Haile Selassie I of Ethiopia by Asfa-Wossen Asserate – Review.” The Guardian, Guardian News and Media, 24 Dec. 2015, www.theguardian.com/books/2015/dec/24/king-of-kings-haile-selassie-ethiopia-asfa-wossen-asserate-review. Whitman, Alden. “Haile Selassie of Ethiopia Dies at 83.” The New York Times, The New York Times, 28 Aug. 1975, www.nytimes.com/1975/08/28/archives/haile-selassie-of-ethiopia-dies-at-83-deposed-emperor-ruled-ancient.html.